Defender Rikki Smith said last week’s win at Bayswater was clinical and gave them a huge boost, but he said it will be worth nothing if they don’t beat Cockburn City on Saturday at the ECU Football Stadium. Smith said the win at the reigning Champions showed how far they have come in the second half of the season. 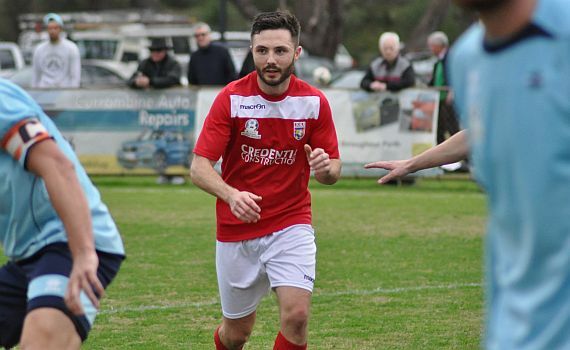 “It was a confident performance from the boys, Bayswater came out of the blocks and put us under a lot of pressure in the first 20 minutes and fortunately some desperate defending kept us in the game,” he explained. Smith wasn’t at the club when they were thrashed 4-0 at Cockburn earlier in the season, which was their last defeat in the league, and Smith said that was a different side, and they know they have to keep winning, if they are to make the West Australian Top Four Finals series. “The coaches took us through the video analysis of the Bayswater game on Tuesday, and although it was a great result we identified a few things we need to work on defensively,” he said.